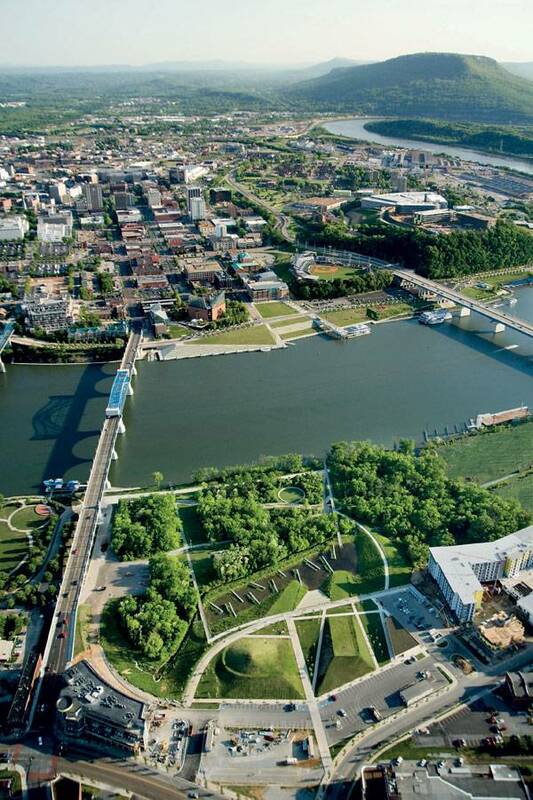 Article by Sophie Thiel Chattanooga Renaissance Park, by Hargreaves Associates, Chattanooga, Tennessee. Abandoned and closed industrial sites are classified as special design projects for landscape architects. These sites often involve specific hazards, such as contaminated soil, which landscape planners have to deal with in a creative way. Renaissance Park in Chattanooga, Tennessee, was one such troubled site. For nearly a century, it threatened to contaminate the surroundings and the city’s waste water system. 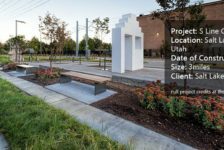 However, the planning bureau Hargreaves Associates redesigned the area in detail, turning the hazardous site into an outstanding park that now even partly manages the city’s stormwater runoff. Completed in 2006, Renaissance Park has been a catalyst for reinvestment in Chattanooga’s growing Northshore neighborhood ever since. 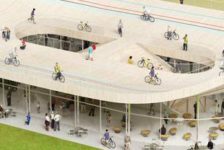 The park is an environmentally focused brownfield redevelopment project that successfully demonstrates how a once-polluted area can be restored to a natural park setting within an urban-driven landscape. 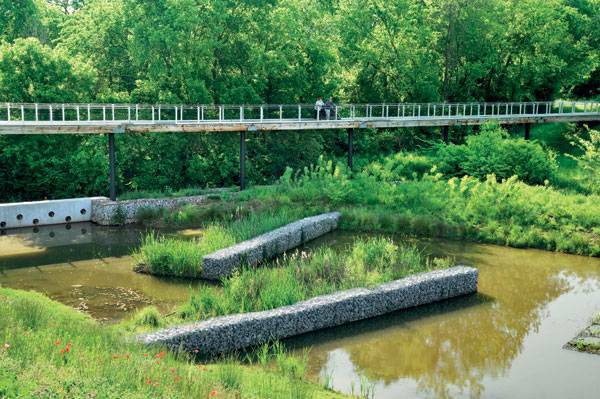 “More than 9,000 feet of walkways provide sufficient space for exercise and relaxation” Renaissance Park was designed with elevated piers over wetlands and riparian banks that offer opportunities for viewing wildlife. More than 9,000 feet of walkways provide sufficient space for exercise and relaxation. What’s the Dangerous Past Behind Renaissance Park? The 23.5-acre park that now invites residents and tourists to take a stroll was once an appliance manufacturing and enamelling facility. This former industrial use left deep marks on the site. After the city of Chattanooga bought the site from the GE Roper Corp. in 2004 as part of the 21st Century Waterfront Plan , an investigation of the area unveiled a massive contamination of the soil. It turned out that enamel frit waste cells left in the water table by the previous owners threatened to leach a range of toxic contaminants into the surrounding site and water systems of Chattanooga, according to a case study investigation by Hargreaves Associates in 2014. Special Circumstances Require Special Measures Hargreaves Associates conducted a digital topographic analysis of the site to generate three-dimensional models of the likely extent of the contaminated soil. 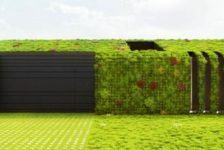 The idea was born to relocate the contaminated material onsite rather than to export it to landfills outside the city, which would have been expensive. The case study investigation of 2014 explains that the analysis made at the beginning allowed the team to redesign the area and properly size the site’s new iconic landforms, under which contaminated soils were to be encapsulated. No sooner said than done: The buried waste was removed from the critical parts of the site onto areas above the 100-year flood elevation. There, it was stabilized chemically and geotechnically, then sealed safely within the park’s iconic landforms, which offer opportunities for recreation, creative play, and views of the Chattanooga skyline. To prevent further groundwater contamination, the wetland was fully lined with a betonite geosynthetic clay liner. 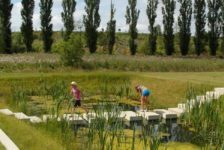 …the landscape planners creatively increased floodplain storage by creating a wetland system… Furthermore, the project team took advantage of the deep cavity that emerged through the excavation of contaminated soil. Instead of trying to fill it up, the landscape planners creatively increased floodplain storage by creating a wetland system. This wetland now collects and cleans urban runoff generated onsite, as well as runoff brought onto the site, before releasing it into the Tennessee River. 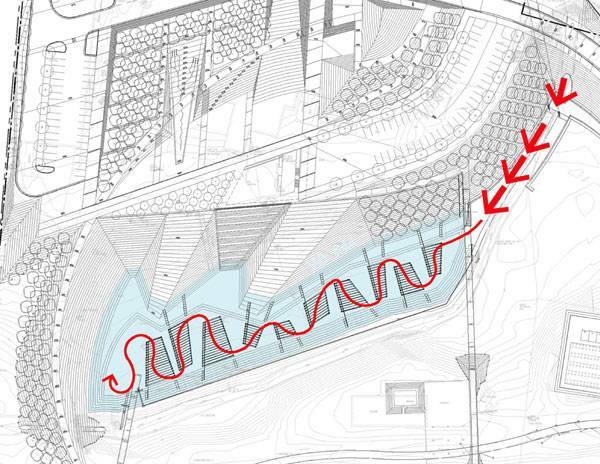 How Does a Former Industrial Site Take an Active Role as a Water Treatment Park? An area that was full of contaminated material is now cleaning water? Actually, that does sound strange. 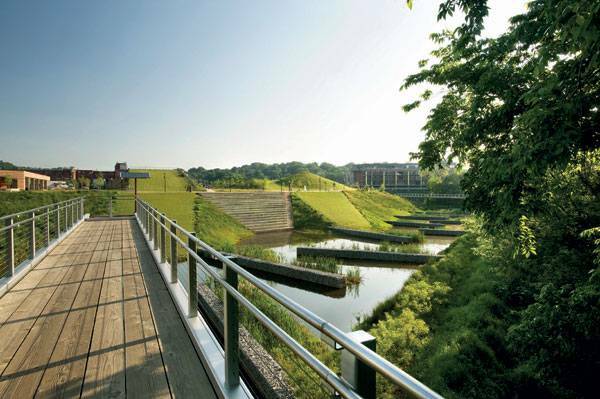 However, the case study investigation proves this to be possible at Renaissance Park: Through a self-regulating gate, the runoff flows into the wetland, where it is slowed by rock-filled, steel mesh basket gabions. 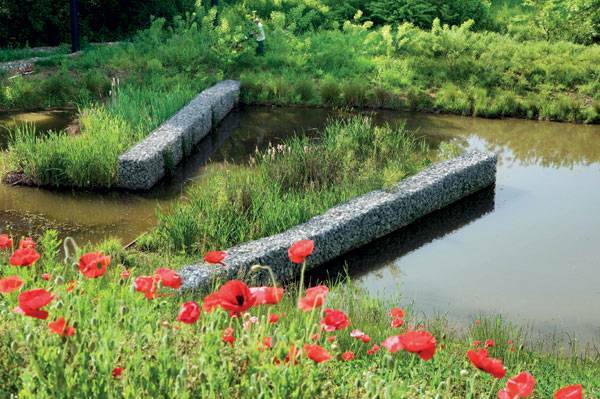 Those gabions also direct the flow of water, causing it to meander through the wetland plant cells that are planted behind every gabion. Those plant cells are wire-mesh structures planted mostly with native aquatic vegetation, such as Typha latifolia, Scripus atrovirens, Sagittaria latifolia, Hibiscus moscheutos, and more. Pollutants are reduced by filtration and the biological action of microbes on the plant roots within these vegetated cells. Is the Constructed Wetland Also Aesthetically Appealing? 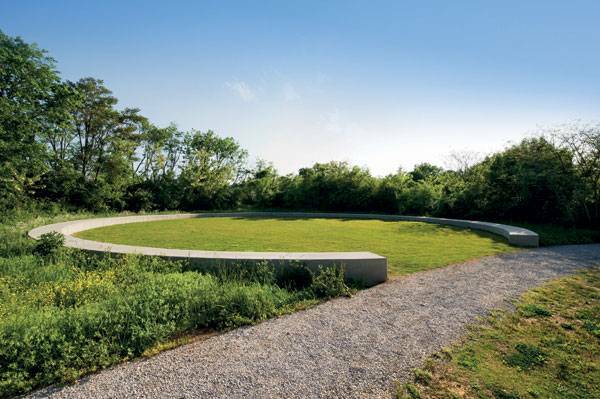 The designers included a terraced, 490-seat amphitheater that arises from the wetland bank, which provides a backdrop for this gathering space. 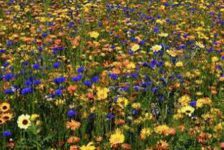 Some of the slopes next to the amphitheater are planted with a natural-looking flower meadow; other places where the lawn is mowed invite visitors to have a picnic or to rest for a while and enjoy the forest scenery on the other side of the floodplain storage. Hence, the constructed wetland serves as both a beautiful viewing and relaxation point and as a fully functioning urban-runoff cleaning system. 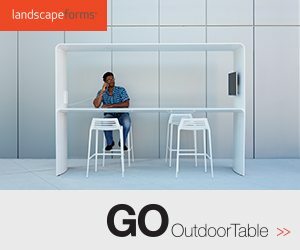 How Was the Site’s and City’s Past Incorporated? Throughout the park, there are various opportunities not only to get in touch with the natural scenery, but also with the past of both Chattanooga and the former manufacturing and enamelling facility. Informative signs mark the city’s cultural history and illustrate the stormwater-treatment process. The Landscape Performance Series website points out: “The signs highlight the site’s heritage as a location of strategic river crossing during the Civil War, ‘Camp Contraband’ encampment for refugee slaves and coloured Civil War regiments, and showing a point of disembarkation for the Trail of Tears.” If the signs aren’t enough for inquisitive park users, they are also prompted to take a cell phone audio tour to learn about the environmental and cultural features of Renaissance Park. 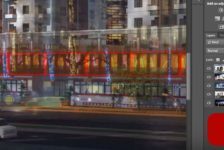 What is the Drop of Bitterness at Renaissance Park? Sadly, even the best solutions are limited somehow. Renaissance Park has a continuing problem with E. coli bacteria. Due to aging sewage and septic water systems still in use within the watershed of the park, an infestation of E. coli is possible at any time. Visitors are informed not to come in contact with the tempting water scenery in the wetland. This dramatically reduces the natural experience at Renaissance Park for visitors who would love to put their feet in the water on a hot day or the children who would enjoy playing in the shallow waters. However, Hargreaves Associates pointed out that the intent was to draw attention to the catchment issue primarily and then to treat as much water as possible in the wetland in order to improve the river water quality. 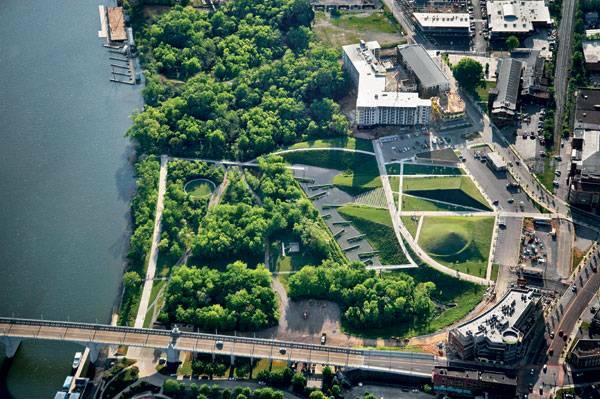 What Can We Learn from the Design of Renaissance Park? Renaissance Park serves Chattanoogans in multiple ways. It seems like nothing of the design was left to chance by Hargreaves Associates. Park visitors are taught about the historical use of the site and also about some of the most troubling parts of Chattanooga’s history. 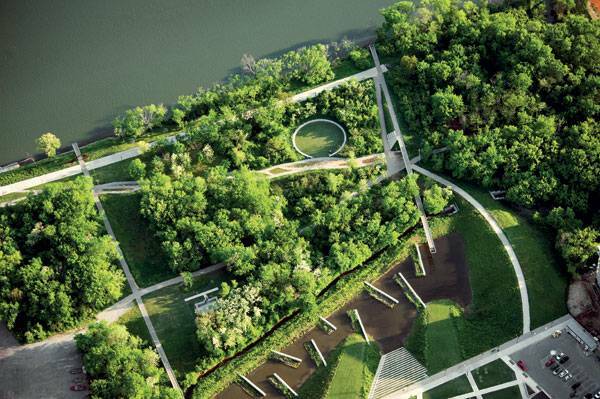 Additionally, the landscape architects managed to seal all of the toxic contaminants and redesigned the excavation bottom as a constructed watershed that treats water runoff and prevents pollutants from getting into the Tennessee River. However, the possible intoxication with E. coli bacteria has a restrictive impact on the perceptual experience of the park. In the future, it would be desirable if the city of Chattanooga would work on a solution for this problem. 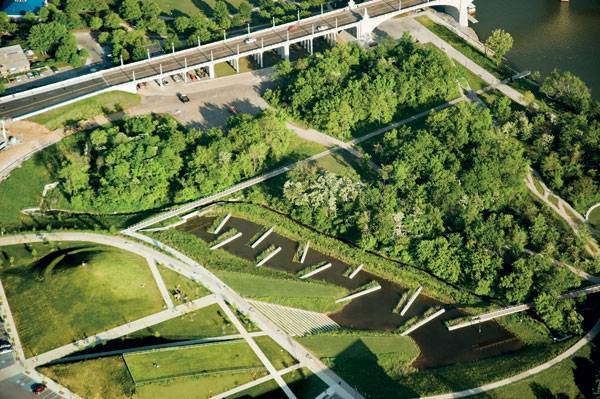 In the end, Renaissance Park successfully proves that a once-polluted area can be turned into an environmentally focused park that treats urban water runoff and is able to handle a 100-year flood. How would you handle such a troubled project site? 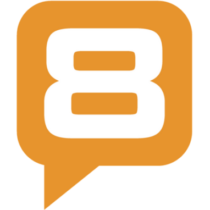 Would you make the same decisions as Hargreaves Associates?